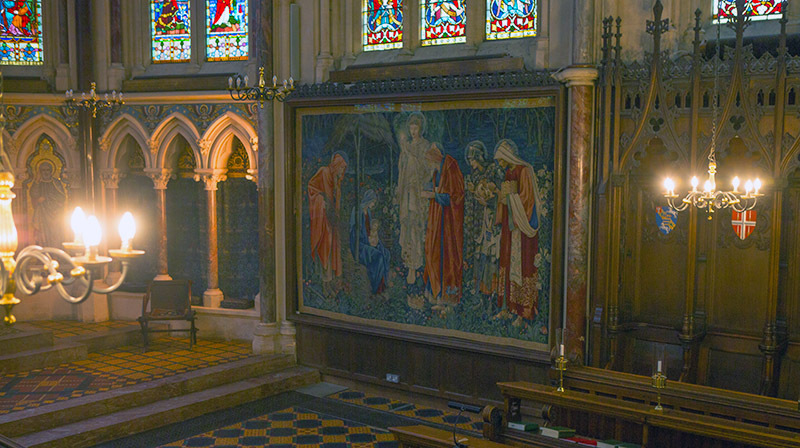 The famous tapestry, The Adoration of the Magi, was re-installed in the College Chapel in Michaelmas term 2018. A short film reveals how this was achieved and how the museum-quality display will protect and enhance the artwork for the enjoyment of generations to come. 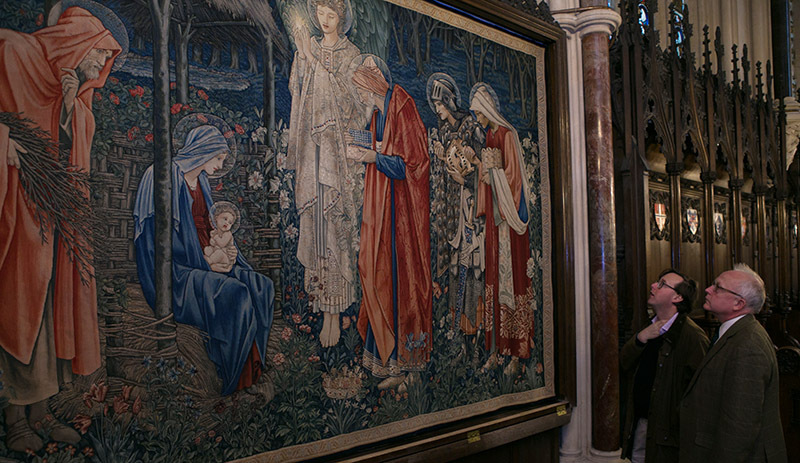 A short film has been produced, revealing how a tapestry by Edward Burne-Jones and William Morris was installed in museum-quality display conditions in Exeter College Chapel. 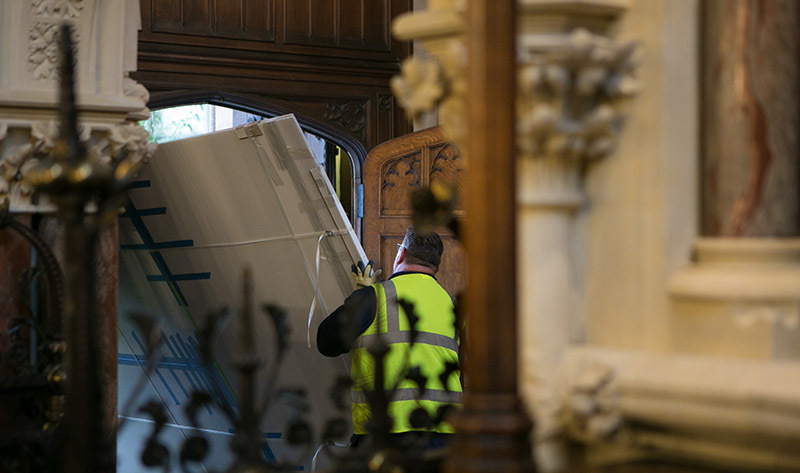 The Adoration of the Magi was re-installed in the College Chapel in Michaelmas term 2018 by a specialist team, improving the viewing experience for visitors to the Chapel and protecting the tapestry for years to come, as the above film shows. Among the people involved in the project was conservator Georgie Dennis, an Exeter College alumna (1988, Modern History). The Adoration of the Magi is one of the finest pieces of religious art from the Victorian era. Designed by Exonians William Morris (1852, Classics) and Edward Burne-Jones (1852, Theology), the tapestry is now protected from damage and displayed in its proper glory thanks to the work of conservators Georgie Dennis (1988, Modern History) and Jonathan Tetley, as well as specialist glazing company Tru Vue. The tapestry was previously displayed behind two panes of glass that interrupted the view of it without protecting it fully from dust, ultraviolet light and other pollutants. The College had been looking for a satisfactory way to protect and display the tapestry for six years, and is now able to do so thanks to advances in technology in the museum world. Georgie Dennis explains: “Framing really can make or break a piece of artwork, both in terms of the aesthetics and how it looks and appears to the viewer, but also in terms of conservation and preserving it for the future. “The biggest challenge was the size of the tapestry and finding the right material to protect it. Glass would have been too heavy and could have only been manufactured in one sheet, which would have been too large to get into the chapel. Wessex Pictures, an authorized Tru Vue distributor in the United Kingdom, approached Tru Vue to discuss the re-glazing project. Wessex explained the difficulty of the size of the tapestry and thought it would be a brilliant use of the seamed version of Optium Museum Acrylic. SmallCorp, based in the USA, has developed a method to join multiple sheets of Optium as a glazing option for oversized works. Wessex handled the logistics of ordering, packing, and shipping from the USA, and installation of the seamed sheet at Exeter. Among the first people to admire the tapestry after it was reinstalled in the chapel was English student Beatrice Alabaster. She comments: “I think the tapestry is looking fantastic. It’s such an obvious change between how it looked before and how it looks now. The colours are so much more vivid, the lines are so much clearer. “It’s really exciting as a university student to be able to step outside of what you’re doing as part of your degree and actually get more of a sense of appreciation for something like art and a work that is so beautiful. I think that’s a really special opportunity and a privilege. Because this was such an unusual project, Tru Vue sent a team to capture the installation of the tapestry on film. You can view the film at the top of this article or by clicking here. Anyone wishing to view the tapestry is warmly encouraged to visit the chapel. Please call 01865 279600 to check that the chapel will be open before you visit.